You may assume that Ct.cki) and Ct,nh* are large enough as to remain constant in the first moments of the reaction, and that kinetic data are taken there. With such data (and without performing any mathematical calculations), answer the following questions (a-d). b) Sketch the species distribution diagram (defined in Section 2.1) in the HCIO/CIO" system c) Sketch the species distribution diagram in the NH+/NH3 system d) On the basis of your responses to a, b, and c, select the graph that best describes the pH-dependent behavior of the rate of this reaction (see the graph options below). *2. Repeat steps b and c from the previous problem, but this time perform the numerical calculations and plot each / vs pH diagram. *3. 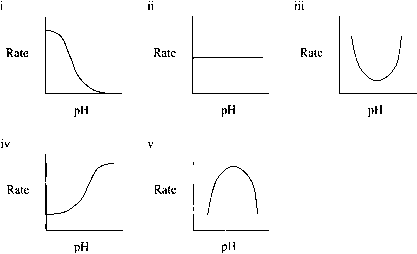 With the data from problems 1 and 2, calculate and plot the rate values as a function of pH in the pH range of 0-14. For simplicity, assume that Ct.ci® = Ct,nhx = 1 x 10~4 M. Compare the shape of this plot to your selection in question Id. 4. Calculate the theoretical concentration of chlo-ramine produced in each of your vials, assuming a 100% yield and that the limiting reagent is NHj. Apolinari, L.; Kowalski, T. "UV-Spectrophotometric Studies of some Properties of Chloramines", Prace Naukowe—Inst. Inzyn. Ochrony Srodowiska Polit. Wroclaws (Poland, in Polish) 1978,40, 89-100. Colin, C.; Brunetto, M.; Rosset, R. "Les Chloramines en Solution: Preparations, Equilibres, Analyse," Analusis (France, in French) 1987,15(6), 265-274. 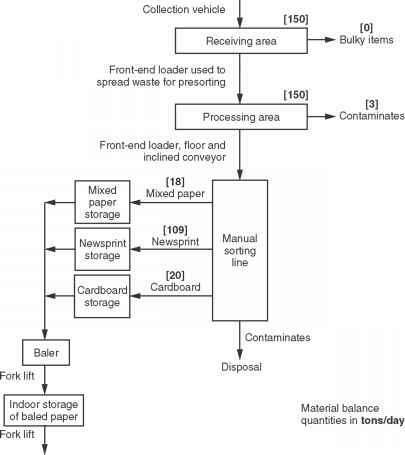 Corral, L. E.; Rodríguez-Ibáñez, O.; Fernández-Sánchez, L. "Activated Carbon Traps to Avoid Pollutants in the Chemistry Laboratories," Educ. Quirn. (Mexico, in Spanish) 2005,16(3), 114-117. Delalu, H.; Peyrot, L.; Duriche, C.; Elomar, F.; Elkhatib, M. "Synthesis of Enriched Solutions of Chloramine Starting from Hypochlorite at High Chlorometric Degree," Chem. Eng. J. 2001, 83, 219-224. Harrington, G. W.; Noguera, D. R.; Kandou, A. I.; Van-hoven, D. J. "Pilot-scale Evaluation of Nitrification Control Strategies," J. Am. Wat. Works Assoc. 2002, 94(11), 78-89. Ibanez, J. G.; Balderas-Hernandez, P.; Garcia-Pintor, E.; Espinoza-Marvan, L.; Ruiz-Martin, R. M.; Arrieta, J. J.; Ramírez-Silva, M. T.; Casillas, N. "Microscale Environmental Chemistry. Part 7. Properties, Preparation, and Characterization of Chloramines," Chem. Educator 2006,11, 402-405. Mattson, B.; Anderson, M.; Mattson, S. Microscale Gas Chemistry, 3rd ed. ; Educational Innovations: Norwalk, CT (USA), 2003. Norton, C. D.; LeChevallier, M. W. "Chloramination: Its Effect on Distribution System Water Quality," J. Am. Wat. Works Assoc. 1997, 89 (7), 66-77. Pepi, F.; Ricci, A.; Rosi, M. "Gas-phase Chemistry of NHXC1+ ions. 3. Structure, Stability, and Reactivity of Protonated Trichloramine," J. Phys. Chem. 2003,107, 2085-2092. Shang, C.; Blatchley, E. R. III. "Differentiation and Quantification of Free Chlorine and Inorganic Chloramines in Aqueous Solution by MIMS," Environ. Sei. Technol. 1999,33, 2218-2223. Stumm, W.; Morgan, J. J. Aquatic Chemistry: Chemical Equilibria and Rates in Natural Waters; Wiley Interscience: New York, 1996. Chapter 11. Tanen, D. A.; Graeme, K. A.; Raschke, R. "Severe Lung Injury after Exposure to Chloramine Gas from Household Cleaners," New Engl. J. Medic. 1999, 341, 848-849. Vernon, L. S. Water Chemistry; Wiley: New York, 1980. Chapter 7. Wilczak, A.; Hoover, L. L.; Lai, H. H. "Effects of Treatment Changes on Chloramine Demand and Decay," J. Am. Wat. Works Assoc. 2003, 95 (7), 94-106. Wrona, P. K. "Electrode Processes of Chloramines in Aqueous Solutions," J. Electroanal. Chem. 1998,453 (1-2), 197-204.